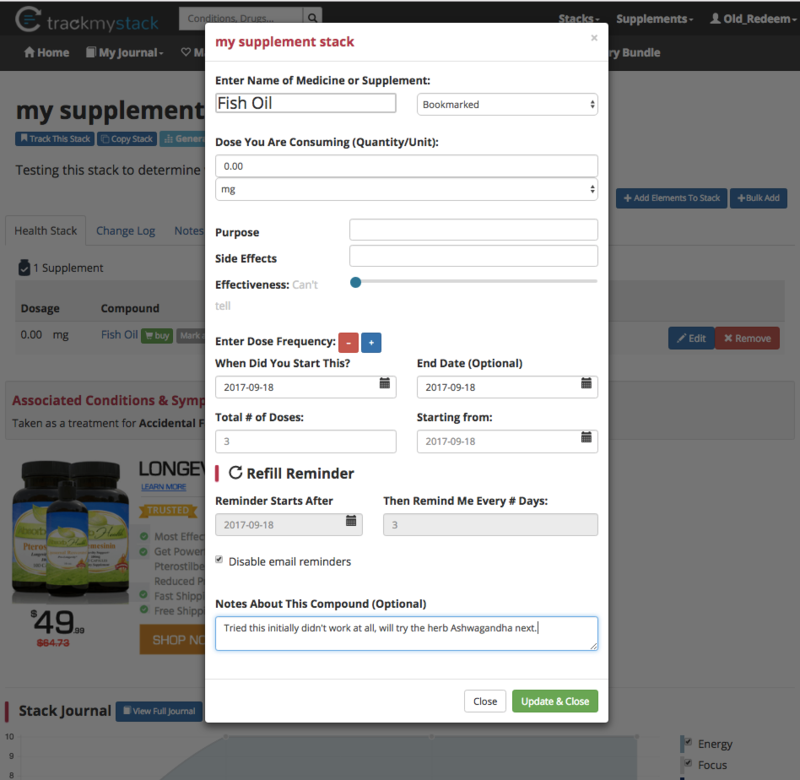 How To: Track If Your Supplement (Stack) Works or Not! 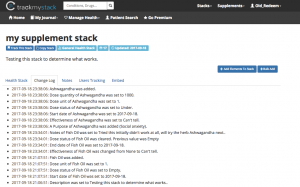 Many people have written in asking for more detailed instructions on how to determine if a stack or a single supplement they are taking is actually working or not. The guide below will demonstrate how to how record your progress when your stack consists of just one supplement initially. It will also show you how to meaningfully record your results if you decide to try another supplement for the same goal. 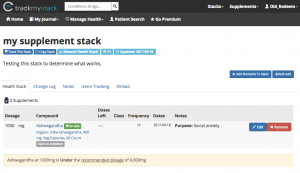 We have written a previous guide on how to setup a stack to track your conditions and symptoms here. Lets start by creating your first stack, once you have signed up, you can click “Create New Stack” from any page. Click any of the screenshots to enlarge them if you need to. Start by entering all the required details for a stack, the first being what you want to call the stack and selecting the purpose, e.g. “Anxiety” and adding conditions if any. 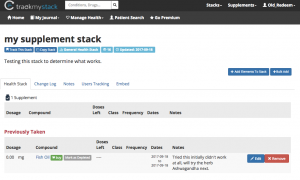 Continue ahead with your stack by adding a description. The reason for entering this information is to inform other users on the platform a bit more about your stack and potentially receiving feedback from others. A detailed reason not only helps you but others understand why the stack was made. 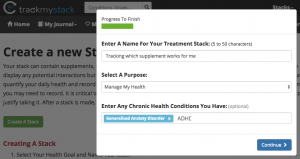 On the final step, you can add one or many supplements, vitamins, minerals or drugs that you may want to track. For the sake of determining what works and what doesn’t for a new goal, we will start by adding just one supplement (Fish Oil) to our stack. 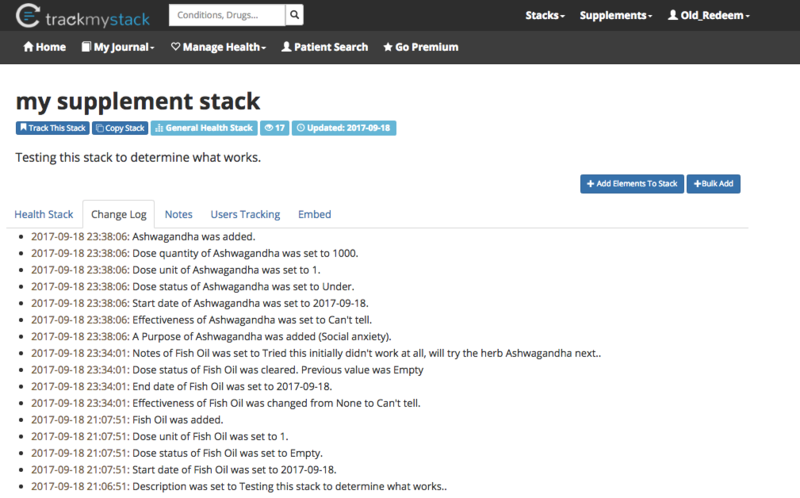 We refer to all items that can be added to a stack as an element and elements can be searched from the search field, added via suggestions (based on goals) and by clicking the green button with the supplement name. Go ahead add your elements and click Continue. Once you have followed the wizard and created your stack, you will be forwarded to your stack page. 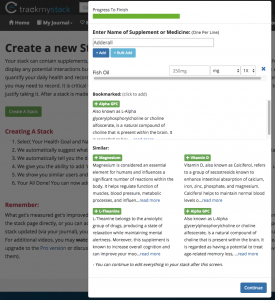 From this page you may modify and tweak your dosage, timings, and add or remove supplements at any time. 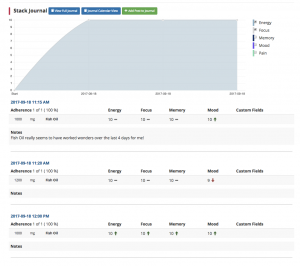 If any changes are made to your stack, it can be viewed by clicking on the “Change Log” tab at the top. If you would like to store notes of any kind without doing a journal entry, it can be done so from the “Notes” tab. 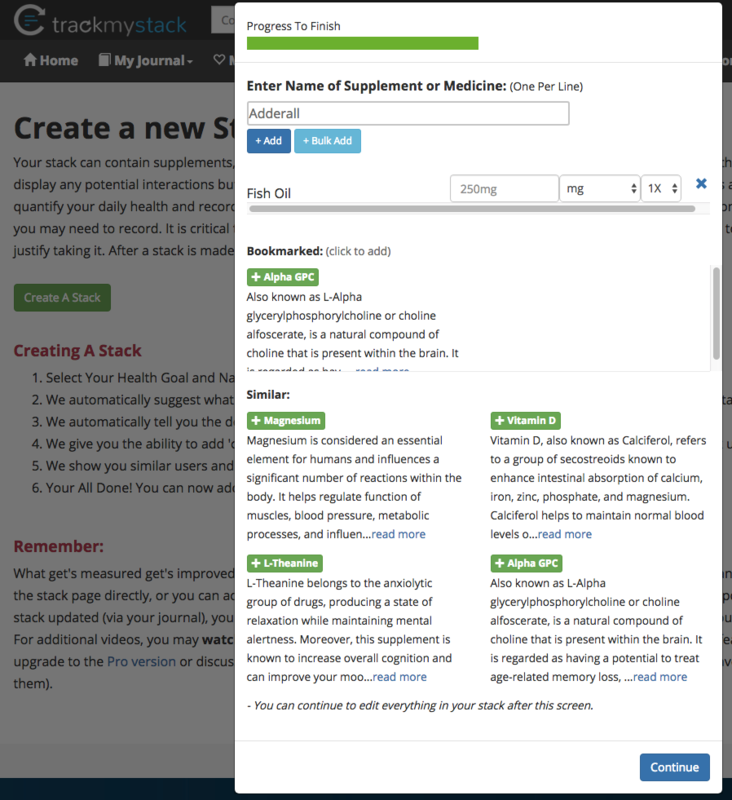 The following screenshot shows the stack page, we will now show you how to record the efficacy of this supplement by journaling in step 6. 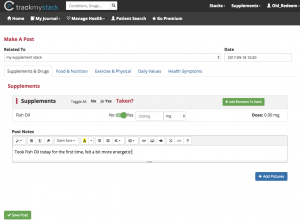 (1) Click Add Post to Journal to be taken to a page where you may add entries to your journal which is connected to individual stacks. 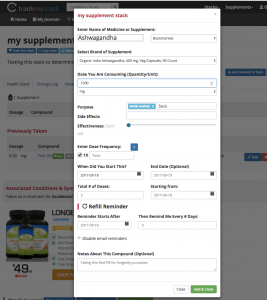 (2) Start by clicking “Yes” or “No” for the supplements you have taken for that day to record your adherence levels. Next add any comment you may want to add along with this individual journal entry. 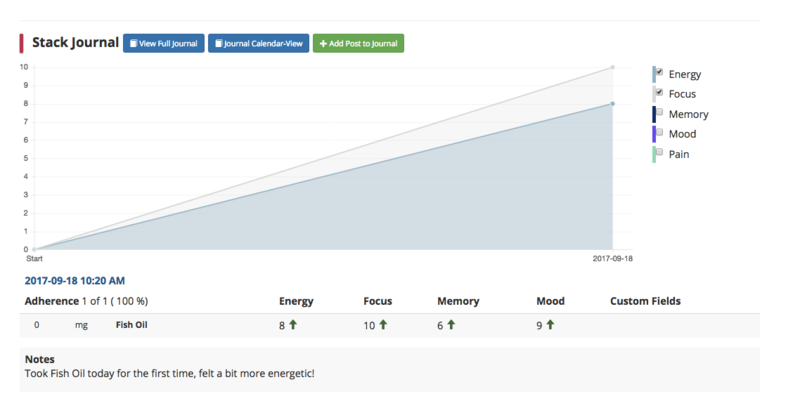 (3) Next, optionally, you may click the “Daily Values” tab and quantify pre-set metrics or add your own. Here we opted to change our energy level, memory and mood based on anecdotal evidence of how we felt after supplementing fish oil which we are taking for relieving anxiety. Once we are done, we go ahead and click “Save Post” at the bottom of the page (in green). 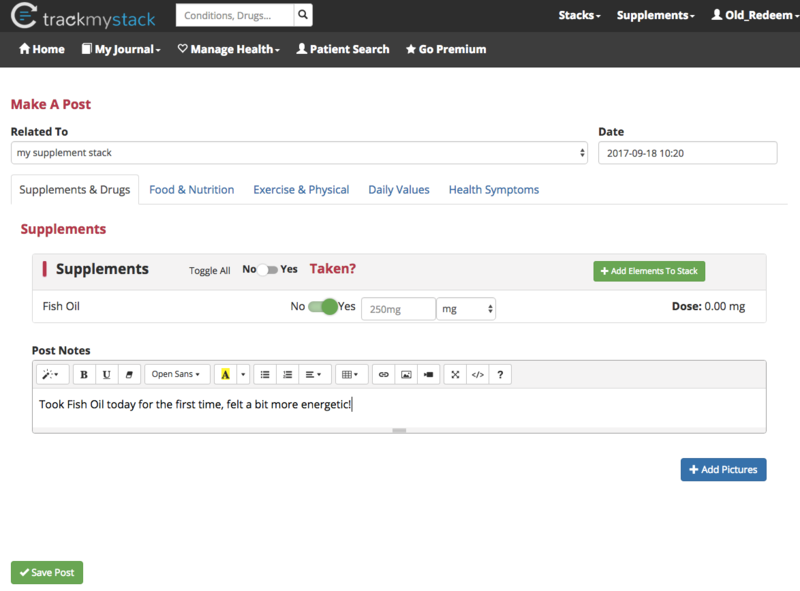 You can now go ahead and see what your post looks like on your stack page. 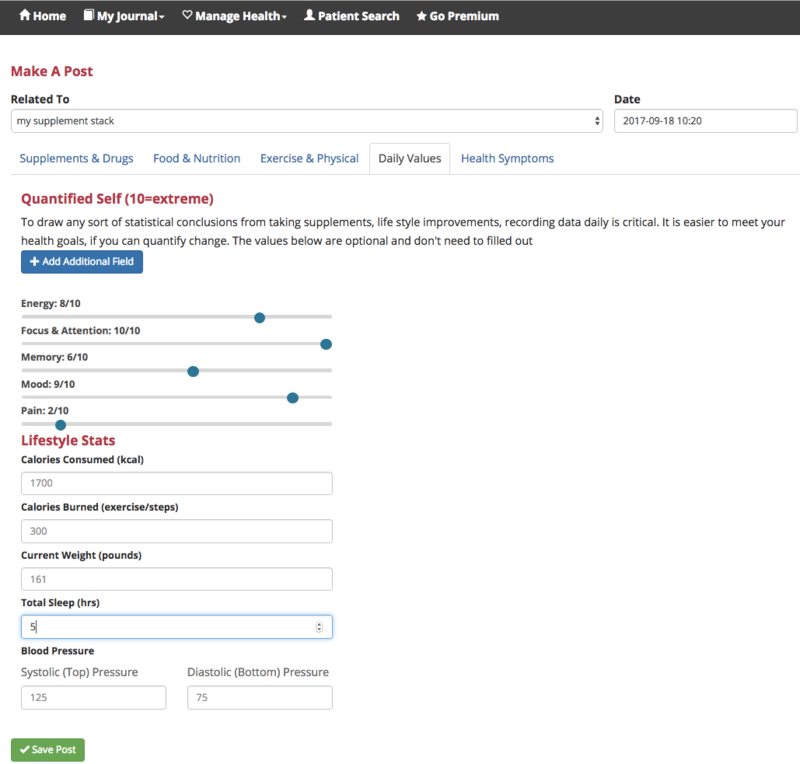 You will notice your metrics are listed and graphed, along with a table displaying your adherence levels. In the next step, we will go ahead and make a few more posts to show you how the journal may look after some time. To see a list of your past entries go here: https://trackmystack.com/logs/ the link to post a journal entry is also in the sub menu bar available when you are logged in. 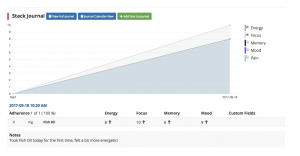 You can see that after taking fish oil for a few days, our focus, memory and mood all start to improve anecdotally. We can also tweak and play around with dosage increases or decreases at the time. 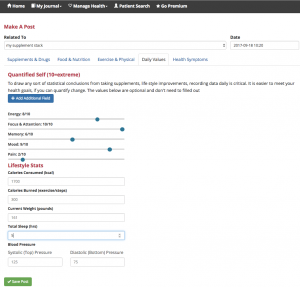 Keep in mind, if you are changing other lifestyle factors such as exercising more or sleeping more or less, all these factors can also be included in each post through the different tabs on the journal posting page as seen in step 6. Let’s assume in the past example the user did not see any changes with Fish oil after consuming it for a while, how do they add or track another supplement? There is no need to create another stack (though you can create as many as you like). 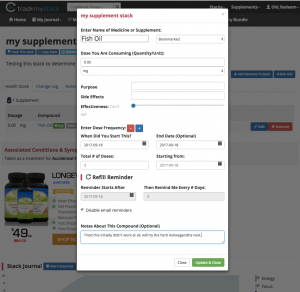 The screenshot below shows the proper way to add another supplement and/or removing an existing one from your stack. (1) You can set the effectiveness to “Can’t Tell” to remind yourself why you stopped taking it. (2) You can set a Start Date and a “End Date” to remind yourself when you started it and ended taking it. 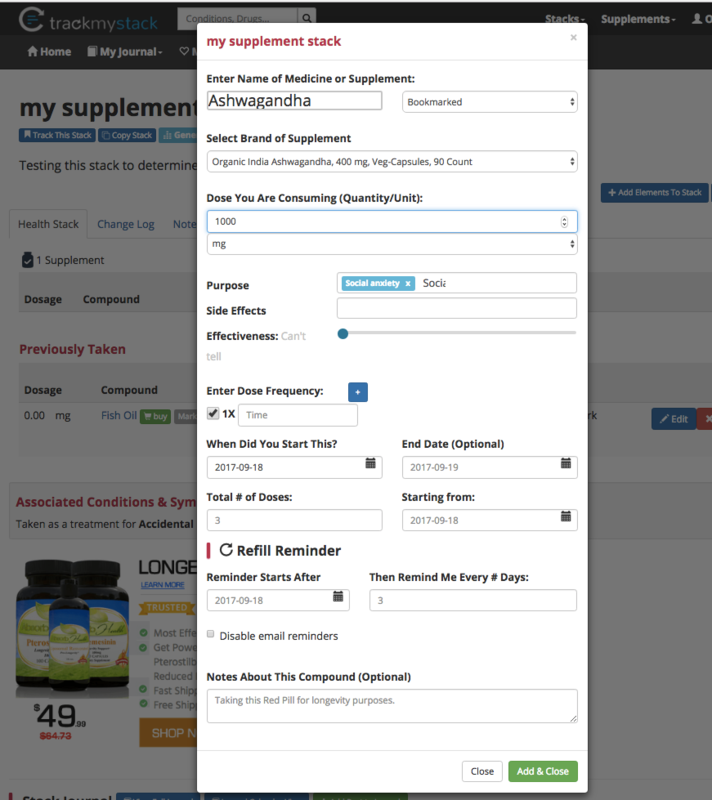 In the final step we click the blue button that says “+ Add Element to Stack” to add another supplement we have decided to try. You are given many options in this dialog box to record, such as the brand you are taking, the dosage and frequency of the new element. 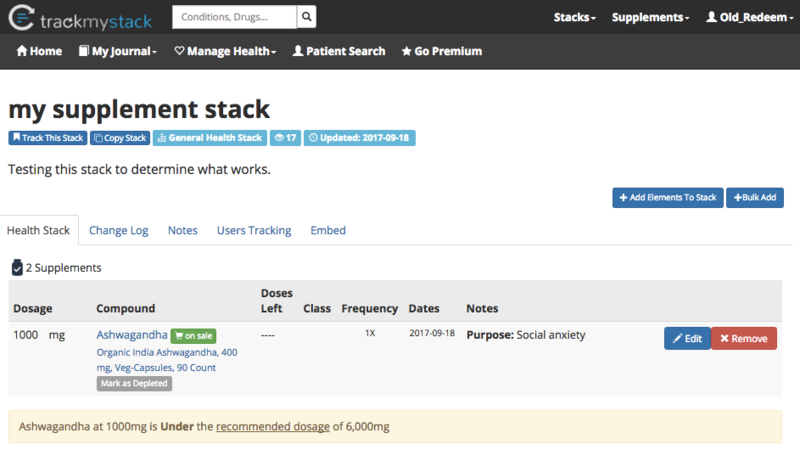 You may also setup refill and adherence reminders (via email) for yourself at this step (or any time later). Below we see the new element added to the stack page with all information we wrote in the previous step saved, along with the a info-tip alerting us that our dosage may not be effective enough. If you had added multiple supplements, our service would also alert you about any dangerous interactions along with supportive ones. This may not be fully comprehensive but provides a general guide. As a final step, you can continue to journal and see your progress, but you can also click through to the “Change Log” tab (At the top of the page), to see how your stack was tweaked over the course of your journey to find the right supplement or track your medication history. 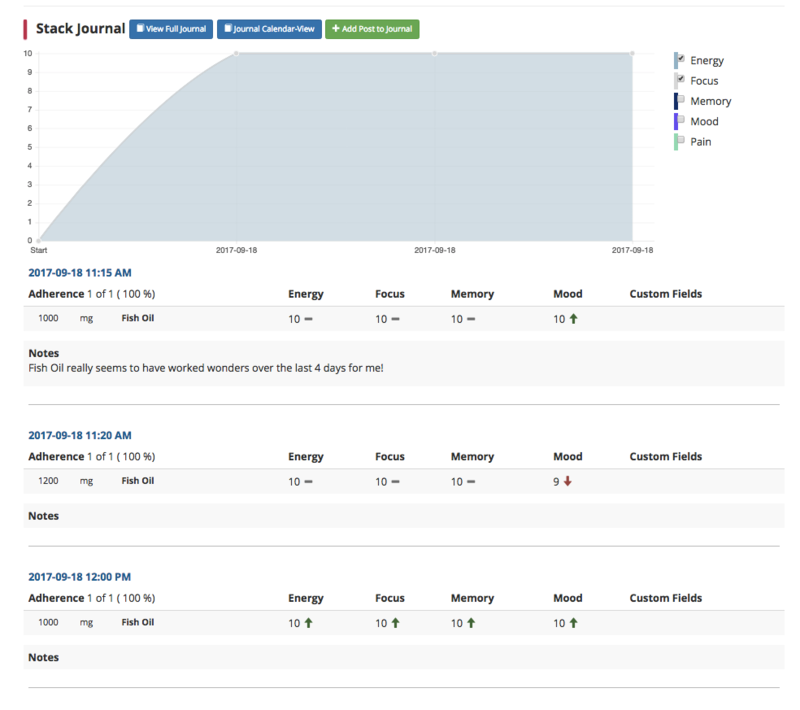 Thus far, we have only shown you the absolute basic features on TrackMyStack, there are dozens of other features that you could find useful such as: advanced graphs (pro feature), the ability to track calories and nutrition. Adding a circle of care (family and caregivers) where your team can monitor your progress privately. 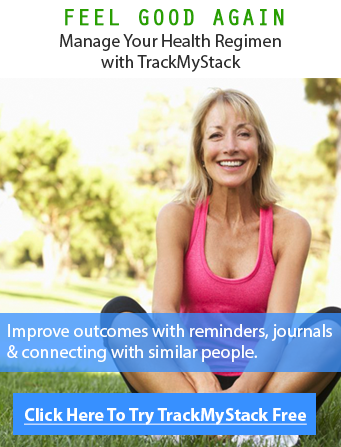 If you need further help you can also contact us or read specific articles with videos such as this one for tracking vitamins, or this one for using TrackMystack as a health diary. Good Luck!